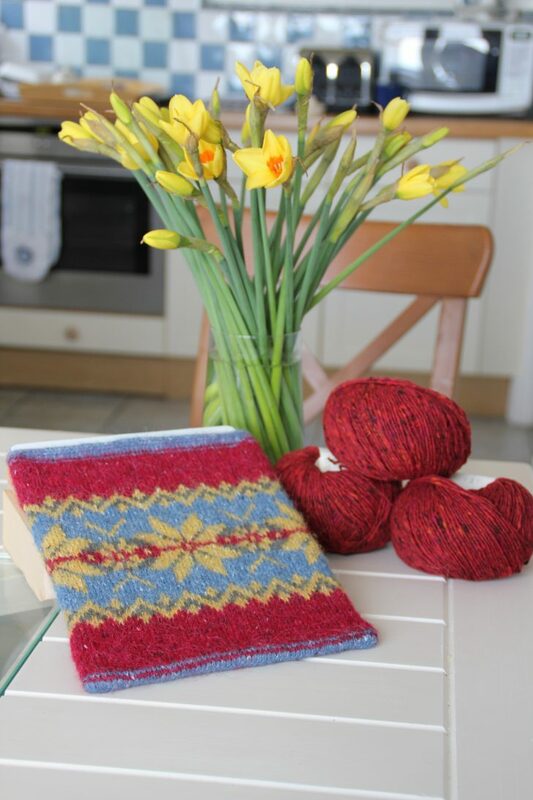 With stunning colours and vintage styling, Polaris makes an attractive cosy for your tablet, and is a great project for using up small amounts of leftover yarn. The project begins with a provisional cast-on, then worked from the top down in rounds. The base of the cover is finished with a 3 needle cast-off/bind-off. Finally, stitches are picked up from the provisional cast-on to work an applied i-cord at the top edge. 25 cm/10″ tall, 20 cm/8″ wide, with a circumference of 40 cm/16″. 4 colours of a light DK/sportweight yarn with approximately 350 metres/382 yards per 100g (175 metres/191 yards per 50g). One 50g ball/skein of each colour is required. The pictured sample was knitted with Rowan ‘Felted Tweed DK’ in Ancient #172, Maritime #167, Mineral #181 and Rage #150. 3.25mm/US 3 needle(s) and 2.75mm/ US 2 needle(s) for small diameter circular knitting. 2.5mm/US 3 needle(s) for applied i-cord knitting. Adjust needle size as necessary to achieve the specified tension. 3.25mm/US E crochet hook for a crochet provisional cast-on. 1 stitchmarker. medium-sized needle(s). 30 rounds per 10cm/4″ in i-cord after blocking, knitted on the smallest needle(s). Stitch tension is unimportant for i-cord.